Do genes influence man’s liberty? Debate is still raging in a philosophical-legal-scientific field, although it was back in 2009 that an Italian court reduced a murderer&rsquo;s sentence by one year because experts identified that the person concerned had a gene called MAOA (monoamine oxidase A), which is associated with a violent nature and anti-social behaviour. Evidently, a person&rsquo;s actions depend on factors such as their personality, genes, circumstances and social circles. How much room is left for individual liberty? The dilemma is as old as man himself: destiny against personal choice, determinism against self-control. Violent people and delinquents always have reasons for their crimes: revenge, necessity, obfuscation, justice, etc. The social contract, norms of coexistence, and that natural law inscribed in the human heart establish limits, judgements and punishments. But if this illegal behaviour is predetermined, does it merit better legal and social understanding? “The major mistake the people make is to think that if you&rsquo;ve identified a cause, it must mean that people are excused or mitigated&rdquo; stated Stephen Morse, a professor of Law at the University of Pennsylvania, in The Verge. Jorim Tielbeek, a neuroscientist and criminologist at the University of Amsterdam Medical Centre, agrees with Morse: a “higher genetic liability towards committing a crime doesn&rsquo;t necessarily mean a lessened responsibility&rdquo;. 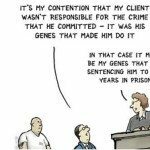 Although scientists have established links, there is “no clear predictive relationship between a single gene and a criminal act — especially since hundreds of genes are involved in criminal behavior, and that each have a very small effect&rdquo;. Despite a handful of controversial examples, the use of genetic makeup does not appear to be having a major impact on legal proceedings.